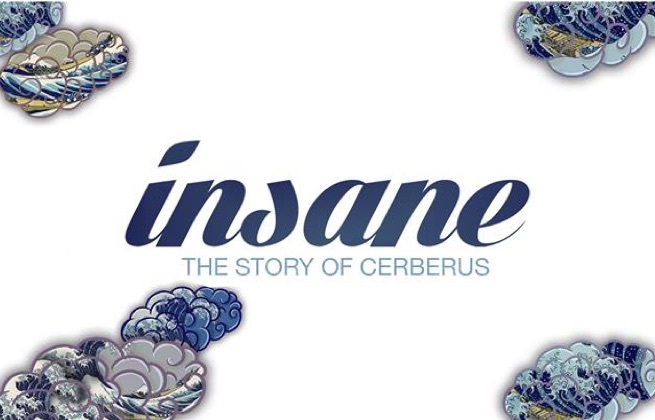 This ticket allows access to both days of the Insane Festival 2019 from Saturday 10th August / Sunday 11th August from 6PM to 6PM (24H NON STOP) . This ticket allows you access to the Insane Festival 2019 on Sunday only, August 11th 2019 from 6AM to 6PM. The Home Apt-Luberon Suite is located in the heart of the Lubéron Massif, 11 mins walk from the center of Apt and 13 mins walk from La cathédrale Sainte-Anne d'Apt. 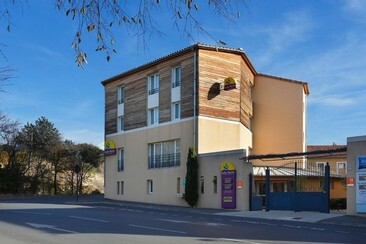 Aix-en-Provence is 40 km from the property. The hotel offers a hot tub, an exercise room, a patio and paid parking. There is also a bicycle and car rental service at the residence’s reception. The suites all come with free Wi-Fi access, flat-screen TV and DVD player. The kitchenette is equipped with a stovetop and an electric kettle. The private bathroom comes with a bath or shower. 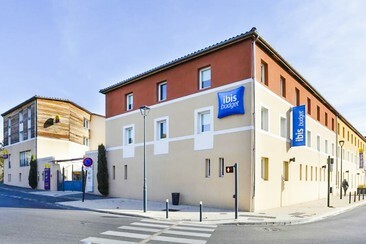 Best Western Sévan Parc Hôtel is set within landscaped grounds, this relaxed hotel is 6 km from the winery Château Val Joanis, and 9 km from the fish and fossil exhibits at Musée Extraordinaire. 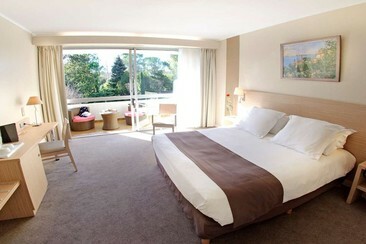 The 3-star hotel features pleasant rooms with a fresh decoration and welcomes you in a typical Provence setting. It is set in a beautiful park with roses, olive trees and lavender. The hotel has a restaurant set by the swimming pool serving modern dishes with typical local flavours. There are also a hot tub, tennis courts and mini-golf, plus a business center and 6 meeting rooms. Pets are allowed for a fee, free parking. Hotel The Originals Mas des Romarins (ex Relais du Silence) is a 19th-century building set in Gordes in the Provence-Alpes-Côte d'Azur Region, a 10-minute walk from the centre of the village. The hotel puts the Luberon's most beautiful village at your feet. This residence is now home to an appealing 3-star hotel, with a heated pool in summer, a private car park, a terraced garden, a spacious lounge, cosy rooms and a gourmet restaurant. 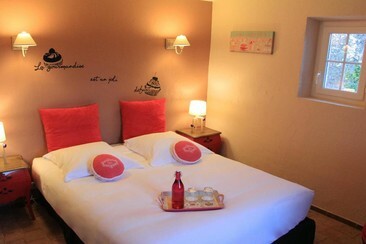 Le Mas des Romarins features free WiFi throughout the hotel. 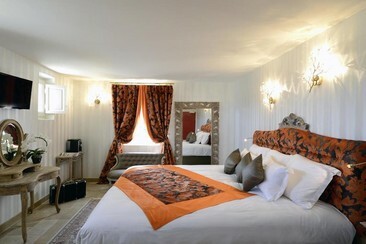 Decorated in a Provençal style, each room at this hotel is air-conditioned and has a flat-screen satellite TV. All rooms are equipped with a private bathroom. Guests can order massages with organic oils at this hotel. The area is popular for cycling and hiking. Under 20 minutes drive to the festival. The Le Petit Palais D'Aglae hotel is located on the hillside by the D15 highway, only 2 km from Chateau de Gordes castle and 31 km from Avignon-Provence Airport. Furthermore, it takes just 15 minutes to drive from the property to the 12th-century Sénanque Abbey and under 20 minutes to the festival. The design of the rooms is eclectic and Italian Renaissance-influenced. They feature an air conditioning, flat-screen satellite TV, coffee machine, safety deposit box, desk, free WiFi access, and garden view. The private bathrooms are well equipped with a shower, hairdryer, bathrobes, toilet as well as free toiletries. Conveniently, the hotel also offers a 24-hour front desk, a seasonal outdoor pool, sun terrace, spa, free private parking, and bicycles. The on-site restaurant serves breakfasts for an extra charge and diverse menu options for lunches as well as dinners. Insane Festival is an electronic music festival in the south of France. Billing itself as one of the most unique in the region, in France and even in Europe, the organisers are driven by their commitment to showcasing dance music in its myriad forms. That means the lineup each year is unencumbered by genre boundaries, with hardstyle, minimal techno, psytrance, house and all manner of other styles on display. The aim: to encourage fans of electronic music to come together as one and celebrate the scene that they all love, regardless of their community or background. The festival moved to a new home for 2018, taking place at the artificial lake in the southern French town of Apt.